A technique called Bose-Einstein or HBT Interferometry allows us to measure the size and lifetime of the fireball created in heavy-ion collisions. The fireball formed in heavy ion collisions at the LHC is hotter, lives longer and expands to a larger size than at lower energies. Correlations between identical particles emitted simultaneously in hadron collisions can be used to determine the dimensions of the region where the particles are produced. The method is similar to that used by radio-astronomers to measure the angular dimensions of sources. In 1956 Hanbury, Brown and Twiss in the UK had developed a new type of interferometer that used correlations in the intensities of radio signals to measure the angular sizes of sources. They extended this later to visible light and stars. In particle physics, around the same time, Gerson Goldhaber and colleagues in the US found correlations in identical pions produced in proton–antiproton annihilations. Subsequent work showed that indeed there are similarities between the statistics in the detection of photons (bosons) and those of the detection of pions (also bosons) in hadron collisions. The energetic collision can be likened to a thermal light source, with correlated pion momenta offering a window on the size of the source. In hadron and ion collisions, there is enhanced production of bosons close together in phase space, due to Bose-Einstein statistics. This leads to an excess of pairs at low relative momentum. The width of the excess region is inversely proportional to the size of the system at decoupling, i.e. at the point when most particles stop interacting. 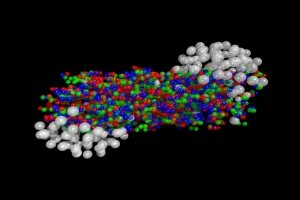 The quark-gluon plasma behaves as a fluid, with strong collective motions described well by hydrodynamic equations. The collective flow makes the size of the system appear smaller as the pair momentum increases. The radius of the pion source is measured in three dimensions : along the beam axis, Rlong; along the transverse momentum of the pair, Rout; and in a direction perpendicular to these two, Rside. The similarity between Rout and Rside indicates a short duration of the emission – explosive emission. The time when the emission reaches its maximum, with respect to the first encounter, is deduced from Rlong and found to be 10 fm/c, significantly longer than at RHIC. The product of the three radii – an estimate of the homogeneity volume of the system at decoupling - is twice as large as at RHIC, indicating a hotter and longer-living fireball.